THE ASTONISHING SECRET OF AWESOME MAN! Can you be first to unmask him? Everyone loves a superhero! Awesome Man is the newest! It's no secret that Awesome Man can fly! 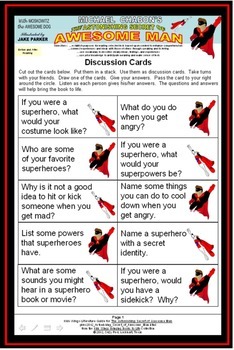 Or that he has a super-cool costume! He can break the sound barrier! He can shoot positronic beams from his eyeballs. He has a powerful grip that can stop a runaway train. He can even scrooch Professor Von Evil! But none of those is Awesome Man's astonishing secret! Can you guess what the secret of Awesome Man IS? 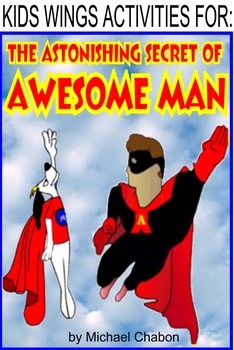 The Astonishing Secret of Awesome Man is the ideal picture book for boys and girls who are just discovering their unique awesomeness and are becoming aware of the battle between good and evil. 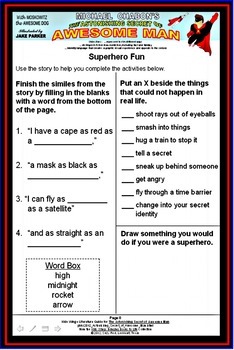 The Kids Wings' Literature Guide will motivate students to use their imaginations to dream heroic dreams. Who knows which of your students will become the next Awesome Man or Magnificent Woman! The Astonishing Secret of Awesome Man cleverly describes the main character and his fight against evil, and sets the stage for some super extemporaneous drama and story writing. Where Did Awesome Man Sit?